Probably most woodworkers have little pieces of exotic wood that they just can't bear to throw away. But how do you secure a tiny piece of wood to your bench so you can work with it? Here's a simple jig that allows you to do just that. The base of this jig is .75" plywood 19.75" x 10" (these are arbitrary measurements, so use whatever works for you). 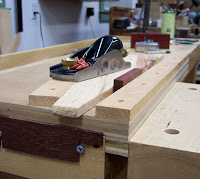 Screw to the bottom of the base a little cleat, or keel, that clamps into your vise. Screw a straight piece of wood .375" thick and 1.5" wide to the top & front of the jig. 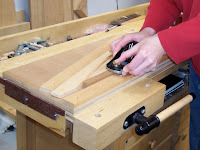 Cut a triangular shaped piece of wood .375" thick that functions as a wedge, and then screw another piece of straight .375" x 1.5" piece of wood to the top & rear of the jig at the same angle as the triangular piece. The triangular piece of wood wedges the workpiece in between the two thin pieces of wood. Tap the wedge in place with a hammer or mallet and that little piece of exotic wood is ready to be planed, mortised, carved, or chiseled. Fortunately, Rosie did live to see another day. Grandma can be a little "too loving" with our pets. Although this post has nothing to do with woodworking, I did make the little rustic table sitting behind my mom.